These days it's so easy to fall into the trap of busyness. Often we tend to confuse activity for achievement. We are busy but we aren't really accomplishing anything beneficial. I once heard someone define the difference in effectiveness and efficiency. They said efficiency is doing things right. Effectiveness is doing the right things. And let me add that excellence is doing the right things right. And those who know Christ and are filled with His spirit, will do the right things right and do them at the right time. Too often we spend so much energy in doing things that we fail to achieve the results that we aimed for. Remember Martha when Jesus went to her house and Mary was there. Martha was running around totally "service" motivated. She was very active. She was busy doing "stuff". It was probably good stuff! But Mary sat at the feet of Jesus. Jesus looked at Martha, the busy one, and said, “Martha, you are careful and troubled about many things”. What he was telling her is that there is a difference in busyness and business. He was saying your activity is prohibiting your achievement. Careful and troubled people seldom use faith. They have no plan. It’s good to have a plan. 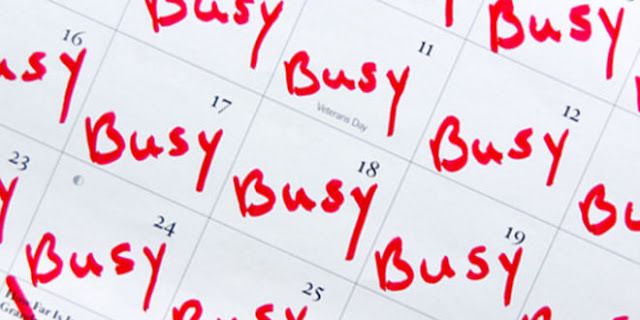 If we can get our business right with God we won't fall into a trap of busyness. Don't let an abundance of activity keep you from an anointed achievement. Get your business right with God today!